A supporter of Democratic politicians and civil rights in the 1960s, Heston later became a Republican, founding a conservative political action committee and supporting Ronald Reagan. Heston was the five-term president of the National Rifle Association (NRA), from 1998 to 2003. After announcing he had Alzheimer's disease in 2002, he retired from both acting and the NRA presidency. Charlton Heston was born John Charles Carter on October 4, 1923, to Lilla (née Baines; 1899–1994) and Russell Whitford Carter (1897–1966), a sawmill operator. Many sources indicate he was born in Evanston, Illinois. Heston's autobiography stated otherwise. Contradictions on paper and in an interview surround when "Charlton" became Heston's first name. The 1930 United States Census record for Richfield, Michigan, in Roscommon County, shows his name as being Charlton J. Carter at age six. Later accounts and movie studio biographies say he was born John Charles Carter. When Russell Carter died in 1966, Charlton's brother and sister changed their legal surname to Heston the following year; Charlton did not. Charlton was his maternal grandmother Marian's maiden name, not his mother Lilla's. This is contrary to how 20th century references read and what Heston said. When Heston's maternal grandmother and his true maternal grandfather Charles Baines separated or divorced in the early 1900s, Marian (née Charlton) Baines married William Henry Lawton in 1907. 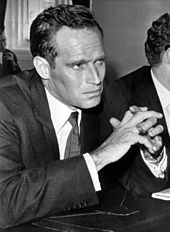 Charlton Heston's mother, Lilla, and her sister May were adopted by their grandfather, and changed their last name to Charlton in order to distance themselves from their biological father, Mr. Baines, who was an undesirable father figure. The Carters divorced in 1933 and Lilla Carter married Chester Heston. The newly married Mrs. Heston preferred her children use the same last name as her. It was thus as Charlton Heston that he appeared in his first film with younger brother Alan Carter (small role), an adaptation of Henrik Ibsen's Peer Gynt (1941). His nickname was always Chuck. Heston was an Episcopalian, and has been described as "a spiritual man" with an "earthy flair", who "respected religious traditions" and "particularly enjoyed the historical aspects of the Christian faith". In March 1944 Heston married Northwestern University student Lydia Marie Clarke at Grace Methodist Church in downtown Greensboro, North Carolina. That same year, he joined the military. After his rise to fame, Heston narrated for highly classified military and Department of Energy instructional films, particularly relating to nuclear weapons, and "for six years Heston [held] the nation's highest security clearance" or Q clearance. The Q clearance is similar to a DoD or DIA clearance of top secret. Heston's first professional movie appearance was the leading role at age 26 in Dark City, a 1950 film noir produced by Hal Wallis. His breakthrough came when Cecil B. DeMille cast him as a circus manager in The Greatest Show on Earth, which was named by the Motion Picture Academy as the Best Picture of 1952. It was also the most popular movie of that year. Heston became an icon for playing Moses in the hugely successful biblical epic The Ten Commandments (1956), selected by director Cecil B. DeMille, who thought Heston bore an uncanny resemblance to Michelangelo's statue of Moses. DeMille cast Heston's three-month-old son, Fraser Clarke Heston, as the infant Moses. The Ten Commandments became one of the greatest box office successes of all time and is the seventh highest-grossing film adjusted for inflation. His portrayal of the Hebrew prophet and deliverer was praised by film critics. The Hollywood Reporter described him as "splendid, handsome and princely (and human) in the scenes dealing with him as a young man, and majestic and terrible as his role demands it". The New York Daily News wrote that he "is remarkably effective as both the young, princely Moses and as the Patriarchal savior of his people". His performance as Moses earned him his first nomination for the Golden Globe Award for Best Actor – Motion Picture Drama and Spain's Fotogramas de Plata Award for Best Foreign Performer. The Egyptian Theater made its second debut in December 1998, with a screening of Cecil B. DeMille's 1923 original The Ten Commandments, which premiered at the Egyptian 75 years earlier. Charlton and Lydia Heston were honored guests and their longtime friends brothers Charles Elias Disney and Daniel H. Disney were seated with the Heston's for this opening showing in the Egyptian Theatre. From 1965 until 1971, Heston served as president of the Screen Actors Guild. The Guild had been created in 1933 for the benefit of actors, who had different interests from the producers and directors who controlled the Academy of Motion Pictures Arts and Sciences. He was more conservative than most actors, and publicly clashed with outspoken liberal actors such as Ed Asner. From 1985 until 1987, he starred in his only prime time stint on a television series in the soap, The Colbys. With his son Fraser, he produced and starred in several TV movies, including remakes of Treasure Island and A Man For All Seasons. In 1992, Heston appeared on the A&E cable network in a short series of videos, Charlton Heston Presents the Bible, reading passages from the King James version. He starred in many theatre productions at the Los Angeles Music Center, where he appeared in Detective Story and The Caine Mutiny Court-Martial, and as Sherlock Holmes in The Crucifer of Blood, opposite Richard Johnson as Dr. Watson. In 2001, he made a cameo appearance as an elderly, dying chimpanzee in Tim Burton's remake of Planet of the Apes. His last film role was as Josef Mengele in My Father, Rua Alguem 5555, which had limited release (mainly to festivals) in 2003. Heston's distinctive voice landed him roles as a film narrator, including Armageddon and Disney's Hercules. He played the title role in Mister Roberts three times and cited it as one of his favorite roles. In the early 1990s, he tried unsuccessfully to revive and direct the show with Tom Selleck in the title role. In 1998, Heston had a cameo role playing himself in the American television series Friends, in the episode "The One with Joey's Dirty Day". In 2000, he played Chief Justice Haden Wainwright in The Outer Limits episode "Final Appeal". Heston's political activism had four stages. In the first stage, 1955–61, he endorsed Democratic candidates for President, and signed on to petitions and liberal political causes. From 1961 until 1972, the second stage, he continued to endorse Democratic candidates for President. 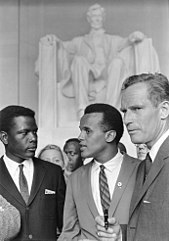 Moving beyond Hollywood, he became nationally visible in 1963 in support of the Civil Rights Act of 1964. From 1965 until 1971, he served as the elected president of the Screen Actors Guild, and clashed with his liberal rival Ed Asner. In 1968, he used his "cowboy" persona to publicize gun control measures. 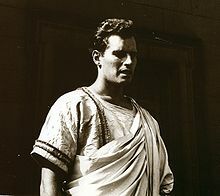 Heston campaigned for Presidential candidate Adlai Stevenson in 1956, although he was unable to campaign for John F. Kennedy in 1960 due to filming on El Cid in Spain. Reportedly, when in 1961 a segregated Oklahoma movie theater was showing his movie El Cid for the first time, he joined a picket line outside. Heston made no reference to this in his autobiography but describes traveling to Oklahoma City to picket segregated restaurants, to the chagrin of the producers of El Cid, Allied Artists. During the March on Washington for Jobs and Freedom held in Washington, DC, in 1963, he accompanied Martin Luther King Jr. In later speeches, he said he helped the civil rights cause "long before Hollywood found it fashionable". 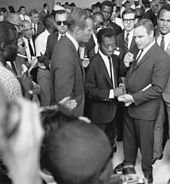 In the 1964 election, he endorsed Lyndon B. Johnson, who had masterminded the passage of the Civil Rights Act of 1964 through Congress over the vociferous opposition of Southern Democrats. That year, Heston publicly opposed California Proposition 14 that rolled back the state's fair housing law, the Rumford Fair Housing Act. Heston charged that CNN's telecasts from Baghdad were "sowing doubts" about the allied effort in the 1990–91 Gulf War. ... the God fearing, law-abiding, Caucasian, middle-class Protestant – or even worse, evangelical Christian, Midwestern or Southern – or even worse, rural, apparently straight – or even worse, admitted heterosexuals, gun owning – or even worse, NRA-card-carrying, average working stiff – or even worse, male working stiff – because, not only don't you count, you are a down-right obstacle to social progress. Your voice deserves a lower decibel level, your opinion is less enlightened, your media access is insignificant; and frankly, mister, you need to wake up, wise up, and learn a little something from your new America; and until you do, would you mind shutting up? In the 2002 film Bowling for Columbine, Michael Moore interviewed Heston at Heston's home, asking him about an April 1999 meeting the NRA held in Denver, Colorado, shortly after the Columbine High School massacre. Moore criticized Heston for the perceived thoughtlessness in the timing and location of the meeting. When Moore asked Heston for his thoughts on why gun-related homicide is so much higher in the United States than in other countries, Heston said it was because, "we have probably more mixed ethnicity" and/or that "we have a history of violence, perhaps more than most countries". Heston subsequently, on-camera, excused himself and walked away. Moore was later criticized for having conducted the interview in what some viewed as an ambush. The interview was conducted early in 2001, before Heston publicly announced his Alzheimer's diagnosis, but the film was released afterward, causing some to say that Moore should have cut the interview from the final film. Early tributes came in from leading figures; President George W. Bush called Heston "a man of character and integrity, with a big heart ... He served his country during World War II, marched in the civil rights movement, led a labor union and vigorously defended Americans' Second Amendment rights." 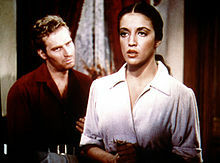 Former First Lady Nancy Reagan said that she was "heartbroken" over Heston's death and released a statement, reading, "I will never forget Chuck as a hero on the big screen in the roles he played, but more importantly I considered him a hero in life for the many times that he stepped up to support Ronnie in whatever he was doing." 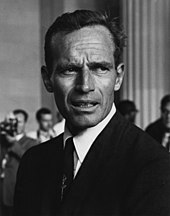 Charlton Heston was inducted as a Laureate of the Lincoln Academy of Illinois and awarded the Order of Lincoln (the State's highest honor) by the Governor of Illinois in 1977 in the area of Performing Arts. ^ a b c d e Eliot, Marc. Hollywood's Last Icon: Charlton Heston, HarperCollins Publishing © 2017; ISBN 978-0-06-242043-5 (553 pages); pp. 11–12 address birthname controversy: "Then, as if to erase everything that reminded her son of Russell, Lilla told him his name was no longer John Charles Carter; from now on he was Charlton Heston." ^ The 1930 United States Census; Richfield, Roscommon County, Michigan. ^ Berkvist, Robert (April 6, 2008). "Charlton Heston, Epic Film Star and Voice of N.R.A., Dies at 84". The New York Times. Retrieved April 6, 2008. 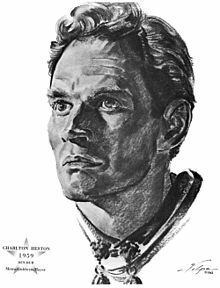 Charlton Heston, who appeared in some 100 films in his 60-year acting career, but who is remembered especially chiefly for his monumental, jut-jawed portrayals of Moses, Ben-Hur and Michelangelo, died Saturday night at his home in Beverly Hills, California. He was 84. ^ "Charlton Heston". Golden Globe Awards Official Website. Retrieved August 18, 2015. ^ "Charlton Heston's Last Sneer", SFGate.com, April 30, 2003. ^ Biography, Filmreference.com; retrieved November 14, 2011. ^ The 1900 United States Census; Cook County, Chicago, Illinois, United States. ^ Werling, Karen (April 16, 2008). "Appreciation: Charlton Heston's life as a Wildcat". North by Northwestern. Retrieved March 18, 2010. ^ Berkvist, Robert (April 6, 2008). "Charlton Heston, Epic Film Star and Voice of N.R.A., Dies at 84". New York Times. Retrieved March 18, 2010. ^ "Charlton Heston Biography". biography.com. March 18, 2010. Archived from the original on September 24, 2011. Retrieved December 11, 2014. ^ a b c Heston, Charlton: In The Arena, Simon & Schuster, 1995; ISBN 0-684-80394-1. ^ Schultz, Rick (1995). "Appreciation: Charlton Heston's Interview, Articles & Tribute". Retrieved March 18, 2010. ^ "Hollywood legend Charlton Heston was proud of Scots roots". Daily Record. April 7, 2008. Retrieved December 11, 2014. ^ "Do not believe everything you see in films". The Argus. ^ "Park City Daily News – Google News Archive Search". ^ a b The 1880 United States Census; Chicago, Cook County, Illinois. ^ My Bay City article, February 5, 2006 Archived November 18, 2011, at the Wayback Machine. ^ Habermehl, Kris (January 25, 2007). "Fire Breaks Out At Prestigious High School". Archived from the original on October 31, 2007. Retrieved June 28, 2008. ^ Staff (1999). AFI Catalog of Motion Pictures Produced in the United States. University of California Press. p. 323. ISBN 978-0520215214. Retrieved December 11, 2014. ^ Raymond, Emilie (2006-08-18). From My Cold, Dead Hands: Charlton Heston and American Politics. University Press of Kentucky. ISBN 978-0813171494. ^ Private Screenings: Charlton Heston (1998). Tcm.com; retrieved November 14, 2011. ^ "New Theater Honors Alvina Krause". Northwestern (magazine). Spring 2010. Retrieved December 2, 2013. ^ Brode, Douglas (April 27, 2000). Shakespeare in the Movies: From the Silent Era to Shakespeare in Love. Oxford: Oxford University Press. p. 102. ISBN 978-0-199-72802-2. Retrieved April 3, 2018. ^ Mecca, Pete (December 10, 2013). "During World War II, Hollywood got serious". Covnews.com. Archived from the original on September 4, 2015. Retrieved August 8, 2014. ^ "Heston tribute to airmen". The Independent. 1997-08-02. Retrieved 2014-08-24. ^ "Top Secret". Orlando Sentinel. Retrieved August 18, 2011. ^ Mike French & Gilles Verschuere (September 14, 2005). "Debora Nadoolman interview". TheRaider.net. Archived from the original on March 27, 2014. Retrieved April 7, 2008. ^ Orrison, Katherine (1999). Written in Stone: Making Cecil B. DeMille's Epic The Ten Commandments. Vestal Press. p. 15. ISBN 978-1461734819. ^ "'The Ten Commandments': Read THR's 1956 Review". The Hollywood Reporter. October 5, 1956. Retrieved 22 August 2017. ^ "Flashback: Original 1956 review of 'The Ten Commandments' in the Daily News". New York Daily News. November 9, 1956. Retrieved 22 August 2017. ^ a b Thomas, Bob (April 6, 2008). "Film Legend Charlton Heston Dead at 84". Associated Press. Archived from the original on April 9, 2008. ^ Rovin, Jeff (1977). The Films of Charlton Heston. New York: Lyle Stuart. p. 224. ISBN 978-0806505619. ^ "The Theater: New Plays on Broadway". Time Magazine. March 7, 1960. Retrieved August 9, 2013. ^ "The Tumbler". Internet Broadway Database. Retrieved August 9, 2013. ^ Hyams, Joe (March 3, 1960). "Heston Not Hurt By Flop Play". Toledo Blade. Retrieved August 9, 2013. ^ Emilie Raymond, "The Agony and the Ecstasy: Charlton Heston and the Screen Actors Guild", Journal of Policy History (2005) 17#2, pp 217–39. ^ "The Omega Man". Rotten Tomatoes. ^ Antony & Cleopatra: Movies & TV. Amazon.com. Retrieved on November 14, 2011. ^ Heston, Charlton: In The Arena, Simon & Schuster, 1995, p. 479; ISBN 0-684-80394-1. ^ Mathews, Jay (May 2, 1986). "Charlton Heston, Statesman On the Set; For the 'Colbys' Star, Acting Is Only Part of the Job". The Washington Post. p. D1. ^ Taylor, Quintard (1998). In Search of the Racial Frontier: African Americans in the American West. W. W. Norton & Company. p. 285. ISBN 978-0-393-31889-0. ^ Heston, Charlton (1995). In The Arena. Simon & Schuster. p. 261. ISBN 978-0-684-80394-4. ^ Goodrich, Terry Lee (February 13, 2000). "Heston decries political correctness at fund-raiser". Fort Worth Star-Telegram. p. 5. ^ Ross, Steven J. (2011). Hollywood Left and Right:How Movie Stars Shaped American Politics. New York: Oxford University Press USA. p. 288. ISBN 978-0195181722. ^ Denning, Brandon P. (2012). Guns in American Society: An Encyclopedia of History, Politics, Culture, and the Law. Santa Barbara, California: ABC-CLIO. ISBN 978-0313386701. ^ David Plotz. NRA President Charlton Heston, slate.com; accessed July 1, 2015. ^ Charlton Heston, Gun-Controller!, slate.com; accessed July 1, 2015. ^ Ross, Steven J. Hollywood Left and Right: How Movie Stars Shaped American Politics. ^ Raymond, Emilie (2006). From My Cold, Dead Hands: Charlton Heston and American Politics. Lexington, Kentucky: University Press of Kentucky. p. 5. ISBN 978-0813124087. ^ Heston, Charlton: In The Arena, Simon & Schuster, 1995, pp. 381, 401–403. ISBN 0-684-80394-1. ^ Heston, Charlton: In The Arena, Simon & Schuster, 1995, p. 433; ISBN 0-684-80394-1. ^ Pulera, Dominic J. (2006). Sharing the Dream: White Males in Multicultural America. Continuum International Publishing Group. p. 254. ISBN 978-0-8264-1829-6. ^ Raymond, Emilie (2006). From My Cold, Dead Hands Charlton Heston and American Politics. University Press of Kentucky. p. 6. ISBN 978-0-8131-2408-7. ^ Raymond. From My Cold, Dead Hands: Charlton Heston and American Politics. p. 1. ^ McDowell, Charles (September 14, 1997). "Charlton Heston, the Gun Lobbyist". Richmond Times Dispatch (Virginia). p. B1. ^ Karen Shimakawa (2002). National Abjection: The Asian American Body Onstage. Duke University Press. pp. 50–51. ISBN 978-0822328230. ^ Schoch, Robert M. (1992). "Redating the Great Sphinx of Giza" Archived February 4, 2016, at the Wayback Machine in Circular Times (ed. Collette M. Dowell); retrieved December 17, 2008. ^ a b Heston, Charlton. Winning the Cultural War, americanrhetoric.com, February 16, 1999. ^ "Heston Champions Second Amendment". CBS News. March 29, 2000. ^ Gold, Dudley Susan. Open For Debate: Gun Control. Benchmark Books. January 2004. ^ Raymond, From My Cold, Dead Hands, pp 5–7, 241, 257. ^ Variety, "Gore fires back after Heston tirade", June 13, 2000. ^ Johnson, Jeff (April 25, 2003). "Heston to Step down as NRA President". The Nation. Archived from the original on April 11, 2008. ^ Boyar, Jay (September 9, 2002). "Heston's remarks bring buzz to Moore's documentary". Orlando Sentinel. ^ Russo, Tom (August 24, 2003). "Opposites attract, Charlton Heston, Michael Moore are a provocative pair". The Boston Globe. ^ Ebert, Roger (June 18, 2004). "9/11: Just the facts?". Chicago Sun-Times. p. 55. "In some cases, [Moore] was guilty of making a good story better, but in other cases (such as his ambush of Charlton Heston) he was unfair..."
^ Whitty, Stephen (April 6, 2008). "The best action hero". The Star-Ledger. ^ Staff (2008-04-06). "Screen Legend Charlton Heston Dead at 84". ABC News. Retrieved 2014-08-24. ^ "Heston's war cry for troops". BBC. April 11, 2003. Retrieved July 1, 2015. ^ "FAQ". Accuracy in Media. Retrieved April 6, 2008. ^ Charlton Heston 'feeling good' after alcohol rehab. ^ "Charlton Heston has Alzheimer's symptoms" Archived August 2, 2013, at the Wayback Machine, CNN News. August 9, 2002. 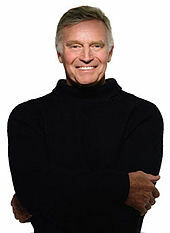 ^ "Charlton Heston – Heston In Rapid Decline", Contactmusic.com, March 6, 2005; retrieved November 14, 2011. ^ Welkos, Robert W. and Susan King. Charlton Heston, 84; actor played epic figures., Los Angeles Times, April 5, 2008; retrieved April 12, 2010. ^ Charlton Heston Dies at Beverly Hills Home, FoxNews.com, April 5, 2008; retrieved April 12, 2010. ^ "Document: Pneumonia Caused The Death Of Charlton Heston". Retrieved January 19, 2012. ^ Ayres, Chris (April 7, 2008). "Charlton Heston, a star who defied the Hollywood liberals, is dead". The Times Online. Los Angeles, California. Retrieved April 7, 2008. ^ Politicians, actors and relatives gather for funeral of Hollywood icon Charlton Heston, International Herald Tribune; retrieved April 12, 2008. ^ "Stars attend Heston's LA funeral", BBC.co.uk; accessed April 13, 2008. ^ "Fraser Heston in conversation with James Byrne". Secret of the Incas web site. May 12, 2008. Archived from the original on October 23, 2012. Retrieved October 23, 2012. ^ "Memorial to Mr. Charlton Heston". Charlton Heston World. Retrieved August 24, 2009. ^ Bob Thomas (April 12, 2008). "Luminaries Attend Heston's Funeral". MSNBC. Retrieved August 24, 2009. ^ "Stars Attend Heston's LA Funeral". BBC. April 13, 2008. Retrieved September 13, 2010. ^ Corliss, Richard (April 10, 2008). "Charlton Heston: The Epic Man", time.com; accessed December 11, 2014. ^ Roger Ebert (April 10, 2008). "Charlton Heston, Richard Widmark: Tough guys, strong presences". Chicago Sun-Times. Retrieved December 11, 2014. ^ "Cinematic Atlas: The Triumphs of Charlton Heston". Film Society of the Lincoln Center. Archived from the original on September 1, 2008. Retrieved September 1, 2008. ^ "Hall of Great Western Performers". National Cowboy and Western Heritage Museum. Retrieved April 19, 2010. ^ Charlton Heston Academy, charltonhestonacademy.com; retrieved August 16, 2012. ^ "Laureates by Year – The Lincoln Academy of Illinois".